No amount of road salt on a cold, slippery winter day will prevent this Lamborghini Countach 25th Anniversary Edition owner from doing rad donuts. 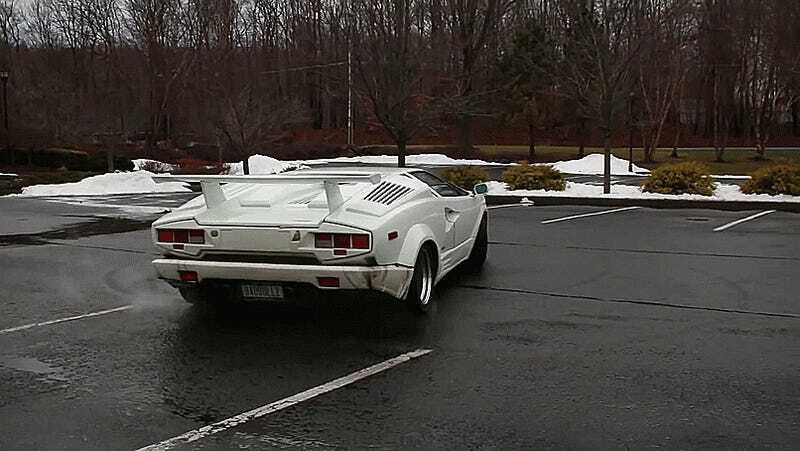 This rare Countach belongs to Michael Roselli’s friend Sal, who asked him, “I’ve got to run some errands today, wanna come with and we’ll take the Countach?” That’s not a question you say no to, even on an icy day in upstate New York. Roselli wrote up the experience for Road & Track right after it happened, but we realized that we’d never featured these marvelous donuts over here, so we’re correcting that now. This is Lambo-ing so right it hurts, using the ultimate show-off car to do the ultimate show-off car moves in rain or shine. Some may cringe at the thought of road salt getting on the car Sal dreamed of owning one day, but I say where there’s a hose, there’s a way. Do more donuts, Lambo owners!